Things have been complicated for the last few months, but sorting themselves out now. 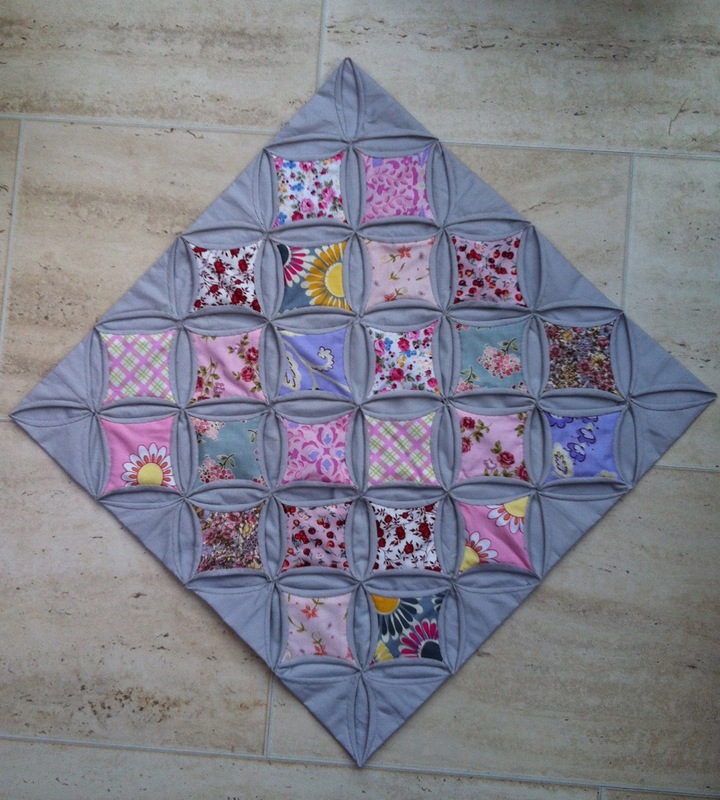 It's a large doll quilt or small table topper. 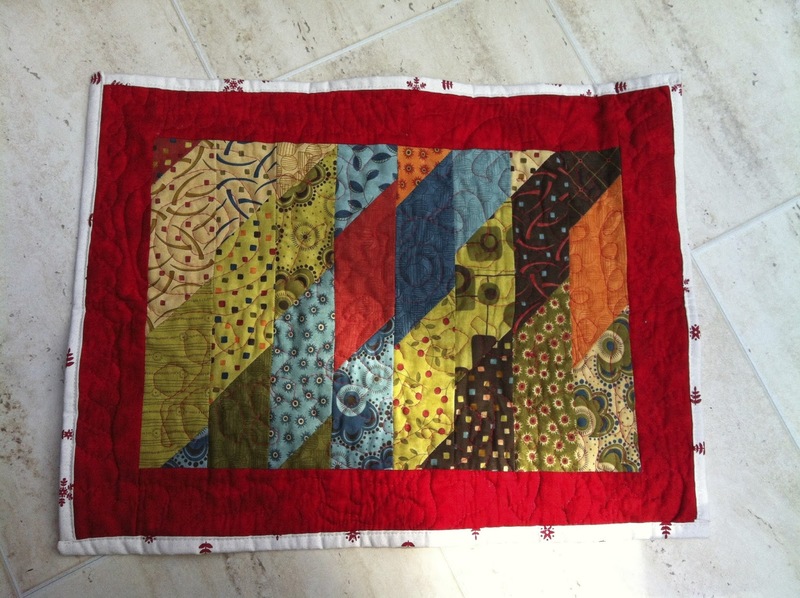 It's also my first try at free motion quilting and it's very 'free'! I have had huge problems with the thread snapping which I think is down to the small eye on the needle; 2 people have now told me that you need a larger eye. 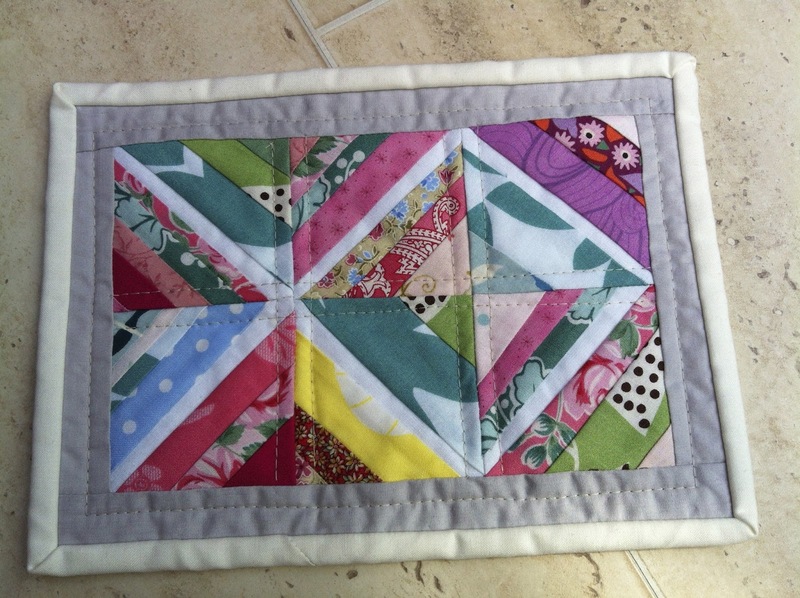 Since this I have only done straight line quilting so I need to try again and see if the larger eye and not more expensive thread will solve the problem. I also finished my cathedral windows from FQR. Not sure if I would do it again or if I just needed to do a bit more machine work at the start. It is lovely and surprisingly heavy for it's size. 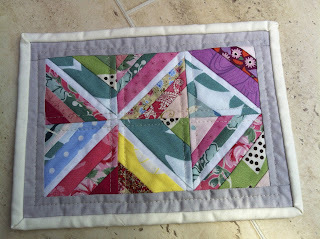 Last week was also tricky and I didn't get the sewing machine out. 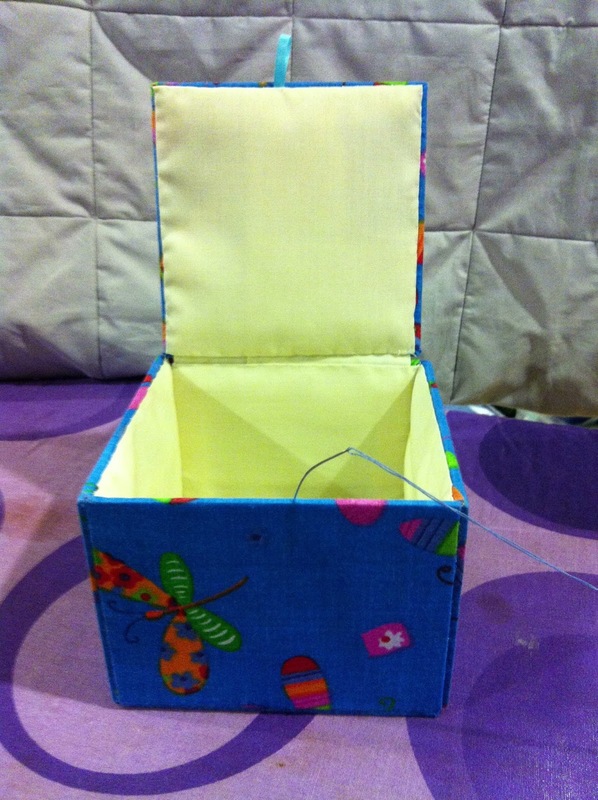 Instead I made a box. 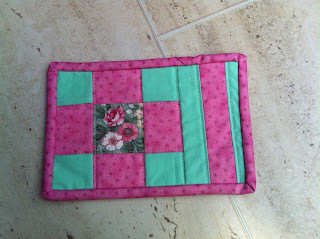 I need curved needles to make it work, hence the improvised one in the photo. I took a regular needle and bent it around the edge of the ironing board! Despite measure twice cut once the cutting could have been better, but all in all I am very happy as now I have somewhere to store my ATC's. Yesterday I finshed 2 mug rugs. Well, there was one that just needing binding and for some reason I just hadn't got around to it. 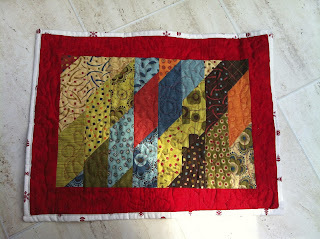 The other I started on Thursday evening as I have always wanted to try string blocks but not make a whole quilt. I was very pleased with how it looks and also to have it done before dinner yesterday. So that's me, hoping that you like the photos and enjoyed the summer. 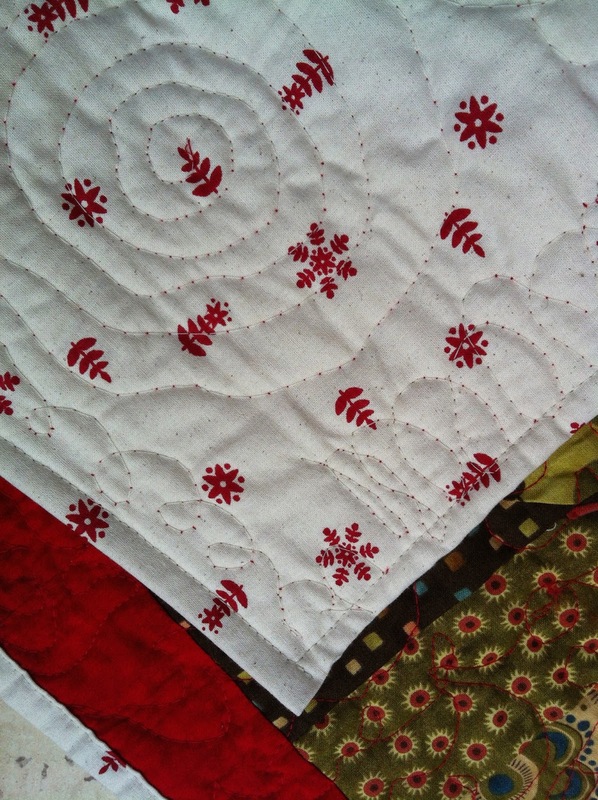 Linking up to Crazy Mom Quilts. Love your string finish. The colours are fabulous. Thanks Pam, I really enjoyed making it.